- Mission Hills takes over the No. 1 spot after Helix suffers a tough loss. 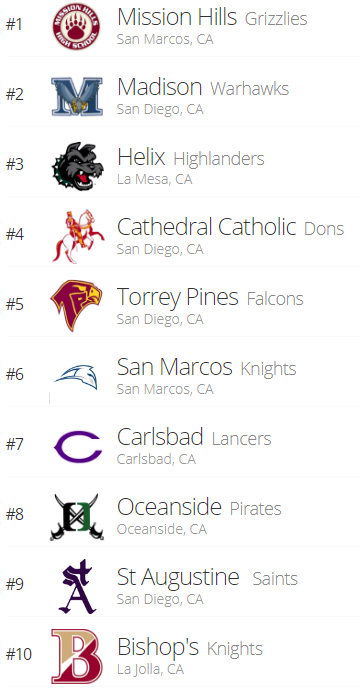 - Carlsbad makes its Top 10 debut following a signature road win over St. Augustine. Others receiving votes: Cathedral Catholic (0-2, 49 points), Oceanside (1-1. 16 points), Eastlake (2-0, 13 points), Ramona (2-0, 10 points), Valley Center (2-0, 10 points), La Costa Canyon (2-0, 7 points). Voters: 28 sportswriters, sportscasters and officials from throughout the county - John Maffei (San Diego Union-Tribune), Terry Monahan, Don Norcross, Tom Saxe, Rick Hoff and Jim Lindgren (freelance writers), Paul Rudy, Brandon Stone and Rick Willis (KUSI-TV), Adam Paul (ECPreps.com), Ramon Scott (EastCountySports.com), Bodie DeSilva (sandiegopreps.com), Ted Mendenhall and Taylor Quellman (The Mighty 1090), Steve Brand (San Diego Hall of Champions), Troy Hirsch (Fox 5 San Diego), Rick Smith (partletonsports.com), Jerry Schniepp, John Labeta and Carlton Hoggard (CIF San Diego Section office), Raymond Brown (sdfootball.net), Montell Allen (MBASports-SDFNL Magazine), Bob Petinak (1360 Radio), John Kentera (Prep Talent Evaluator), Steve Dolan (Mountain Country 107.9-FM), Jim Arnaiz, Mike Dolan and John Carroll (CIF Football Tournament Directors).